I's intrigued when Savi made cinnamon sticks as its my fav.. I always ask VJ for this when I esp go to Grapevine Mills. But ,not in a mood, to start from scratch. I's looking for alternatives and this caught my eyes from MC Cormick website. It was so simple and hardly takes 15 minutes to prepare this using the storebought readymade Pillsbury breadstick dough. Lovely, they made my job easier , still have one more can left, thinking of trying garlic breadstick (Pizza hut type ). 1. Preheat oven to 375°F. Prepare the breadsticks as directed on package. Cut each breadstick widthwise. Pull each about 6 inches in length. 2. Place the melted butter in a bowl / plate . 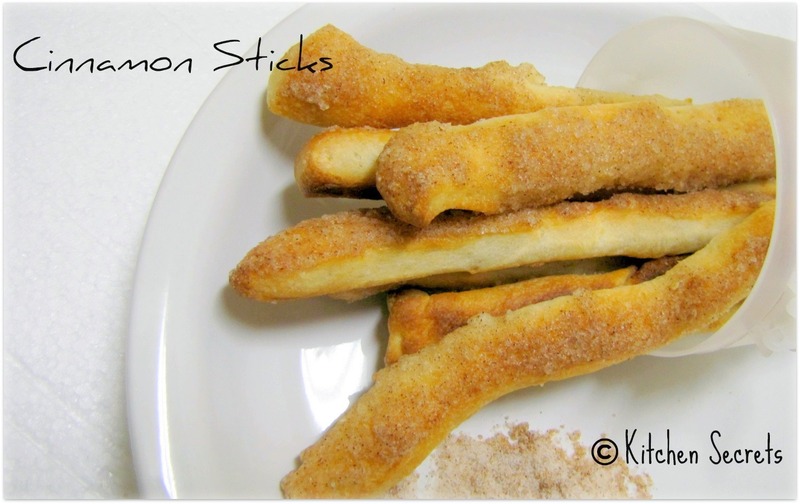 Place the cinnamon + sugar mixed in another plate .Dip one side of the breadstick in melted butter. Then dip the same area in cinnamon sugar. Place it on the greased / lined baking sheet . Cinnamon coated area should face the top . U may also twist and place on lightly greased baking sheet . 3. Bake 10 to 13 minutes or until golden brown. Cool on wire rack. 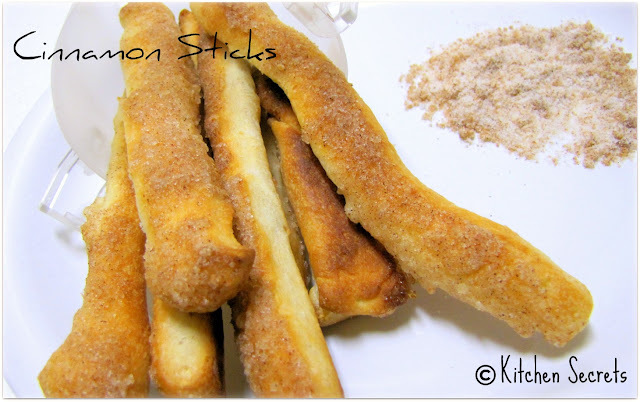 wooow, don't forget to pass over the plate to me..
cinnamon bread sticks looks delicious. hi there, first time to you blog and I love your posts! Cinnamon sticks look fab! the bread sticks look very tempting and inviting. Looks soo yumm..love the cinnamon flavour!! Wow,such flavorful bake isnt? Looks amazing! Those bread sticks looks soo adorable and yummy.. Ohhh..I so love the sweet aroma of cinnamon n these looks delightful..what a great quick fix munchie dear.. Very new to me,looks and sounds wonderful! Omg, thats adelicious cinnamon breadsticks,soooo tempting and loving it. I love cinnamon pretzels so why not love this.Awesome..
Wow so yummy and falvorful bread stick..Loved it Shanavi. wow...the breadsticks look soooooooo good !! really delicious !!! 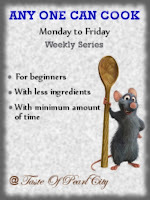 check out my blog http://onlyfishrecipes.blogspot.com/ too and let me know your valuable comments ! These sticks looks crispy n lovely, irst time here, happy following you!